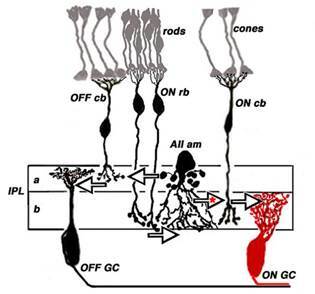 Do rod-photoreceptors only form synapses with on-center bipolar cells (and on-center ganglion cells in the next step)? If so, why is that? Why do rod-cells only connect to on-center cells, while the cones connect to both on- and off? Am I correct in saying that what happens in the bipolar cell as a response to light stimulus on a photoreceptor depends on i) Wether it is an on-center or off-center bipolar cell - and of course where the light stimuli is focused on the bipolar cell (periphery or center), or ii) What kind of receptors the on-center and off-center bipolar cells have? This is the part where I get really confused, because I read somewhere that what kind of receptors On/Off-center bipolar cell have, is not something set in stone? So saying that On-center bipolar cells have AMPA receptors and will, as a result of that, react in a specific way to less Glutamat release would be wrong? How does this release of neurotransmitter works together with central / periphery stimuli. Let me try and use an example, You have an on-center bipolar cell. What will happen if light is focused on the center of this cell's receptive field? And what will happen if it is focused on the periphery? Let's just say that the light hitting the center of this cell's receptive field causes it to be depolarized. But is it really the light hitting the center which causes this effect, or is it the decrease in Glutamate release from the photoreceptor that causes this effect? If the latter, then what does it really matter if the light hits the periphery or the center of the bipolar cell's receptive field? The photoreceptor is hyperpolarized by light either way and less Glutamate will be released no matter what. Also, in order for this to make sense, the light that enters the eye is absorbed by the photoreceptors pigmentmolecules, but some of the light also has to hit the receptive field of the bipolar cell in order to decide which signal to be transmitted? So not all of the light is absorbed by the photoreceptors then? 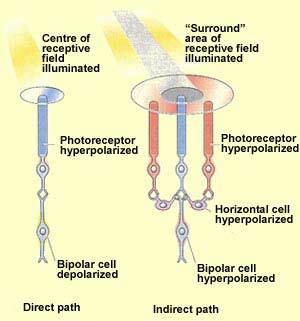 If the light hits the periphery of an On-center bipolar cell, you will have an inhibitory effect, is that right? And the other way around, if the light hits the center of the cells receptive field, you will get an excitatory effect? But I am curious as to how this also has to do with the kind of receptor that the on-center bipolar cell has (AMPA or MGluR6). 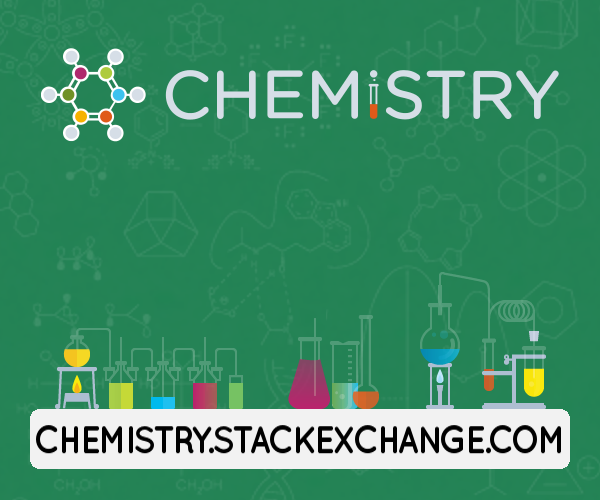 First off, the post is quite lengthy and contains various sub-questions. I will answer the first two questions in detail, but only after starting with an abstracted overview of photoreception in the retina. By the looks of it, your basic understanding of photoreceptors and secondary visual neurons is incorrect. Clearing the general neurophysiological workings of the retina up should get you on your way in understanding questions 3 - 6. In Fig. 1 a schematic of the retina is shown. It basically consists of three layers. Layer one contains the photoreceptors, namely the rods and the cones. These primary sensory neurons absorb the light with photopigments and generate electrical signals in response to that. The photoreceptors, in turn connect to the second layer, namely bipolar cels, horizontal cells and amacrine cells. These cells are responsible for the center-surround structure of the receptive field of the last layer of cells (Fig. 2), namely the retinal ganglion cells in the front of the retina, whose axons pass across the surface of the retina and form the optic nerve (Kolb, 2017). 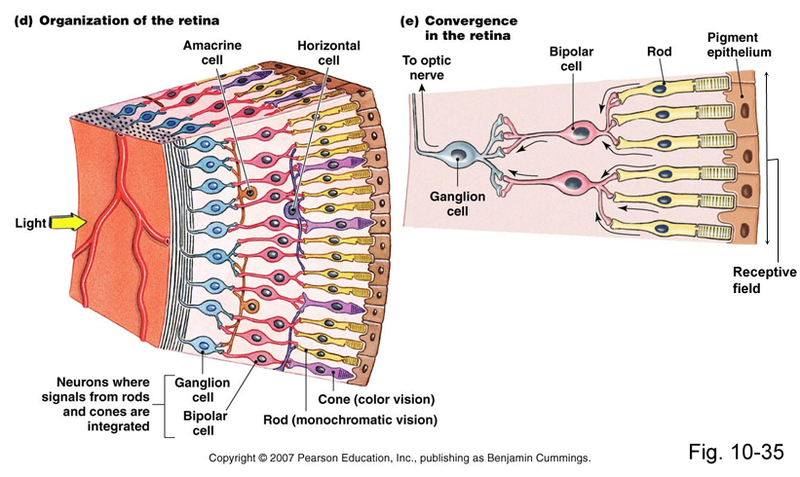 Note that there are no light-sensitive cells in the retina besides the rods and cones (barred the retinal melanopsin ganglion cells, but please forget that for the sake of simplicity). This one detail should basically clarify the sub-questions 3 - 6 in your post. The first two questions I will address next. Do rod-photoreceptors only form synapses with on-center bipolar cells (and on-center ganglion cells in the next step)? Rod bipolar cells in the mammalian retina are of the ON type. In contrast to the cone system, rod bipolar cell signals are split into ON and OFF components by amacrine cells. The cone system piggybacks then on the cone system; Rod ON signals flow from rod bipolars to amacrine cells to ON cone bipolar cells. Rod OFF signals are generated between amacrine cells and OFF cone bipolar cells (Nelson & Connaughton, 2017). See Fig. 3 for an overview of the retinal connectivity between rod and cone bipolar cells. Not the answer you're looking for? Browse other questions tagged neuroscience neurophysiology vision eyes human-eye or ask your own question. What determines the shape of the center-surround receptive fields of retinal ganglion cells? What information do bipolar cells encode?